Happy Tuesday! I’m sure everyone has picky eaters and most will tell you that I’m one of those picky eaters. Tonight’s dinner is a kid approved favorite in our house. In fact, my lunch plan is usually leftovers from the night before, and tomorrow’s lunch was in jeopardy is being eaten by my husband! What is this delicious dish you might ask? Bacon Cheeseburger Casserole. Now, I will be the first to admit that it’s not the most attractive looking dish. Don’t let looks prevent you from trying this dish. It’s based on a recipe from Once A Month Meals and makes 2- 8″ round pans worth. Our family of 4 will empty the pan, so if you have a bigger family, you’ll want to make it into 1 dish. Of course I love to make this in disposable pans with lids that crimp on when I make them. This dish does require some cooking on your BIG cook day, but it isn’t too difficult. Well worth it! Enjoy dinner everyone! In a large bowl, combine ground beef, both soups, garlic, dried minced onion, salt and pepper. Pour into 2 round or square cake pans. I prefer to use the ones with the crimp lids. Divide french fries or tots evenly over the top of the ground beef mixture. Bake 350F for 45-50 minutes or until french fries are golden brown. Top with crumbled bacon and cheese and return to the oven until the cheese is melted. Add your favorite burger toppings and serve. Prepare as above, but do not bake. Cover tightly with either aluminum foil or your crimp lid. Be sure to label your dish and add the cooking day directions. When your’re ready to eat this dish, thaw first. Bake 350F for 45-50 minutes or until french fries or tots are golden brown. Serve with pickles, onions, and ketchup if desired. Notes: An easy shortcut for using crumbled bacon is to buy the precooked variety. I buy a big bag at Costco near the spices. Fresh bacon also works, but takes longer and creates another pan for me to wash. My husband prefers to put this dish under the broiler after adding the cheese and bacon to get it nice and bubbly. Keep an eye on it or you’ll burn your wonderful dinner! This recipe is based on the original Cheeseburger & Fries Casserole from Once A Month Meals. What a Monday!! Every Monday could start with that comment. The end of the year is quickly approaching… that means meetings and such after school. Thankful again for my freezer! After the meetings and then picking up my class’ fair projects to take BACK to school, it was nearly 7:00. My lovely husband had already made dinner and all that was left was a lone plate sitting on the counter for me. None the less, it was as simple as heat it up in the microwave and make a pot of Mexican spiced rice. (Rice cooker rice plus some seasoning = Mexican flavored rice not from a box) The recipe for tonight’s dinner came from the book Don’t Panic, Dinner’s in the Freezer by Susie Martinez, Vanda Howell & Bonnie Garcia. I made some minor changes to it to make it a little bit healthier and easier. You can of course change it to suite your needs. 1. Sprinkle salt in skillet over medium heat. Brown beef, garlic, and spices. Cooke until meat looses it’s pinkness. Stir in remaining ingredients. ** You can stop here and freeze the meat mixture now. On cooking day you will load them into the tortillas and bake. I like to make them all the way done, freeze them individually, and then simply defrost and reheat on the day I want them. Makes it easier to take to work too. 2. Melt butter in a pan or spray each tortilla with butter spray (healthier). Fill with about 1/3 cup of filling. Fold the tortilla up like an envelope. Place seam side down in an ungreased 11×17 pan. Continue with the remaining tortillas. (Should be about 9). YUMMY YUMMY for the TUMMY! Well I have been gone for awhile from my blog, but rest assured my freezer and I have been very busy! So busy that I have not had much time to write the blog. Lol. Many things have changed since my last post. Our family grew by 1, giving us 2 beautiful boys. I know am the proud owner of a used stand up freezer. SO LOVE MY FREEZER! We froze lots of things before our stand up freezer, but now we are able to freeze larger items, including MILK! Yes, you can freeze milk. So we now buy 4 galls on milk at Costco and are able to freeze them and use one each week. People often ask my why I freezer cook or why I spend an entire weekend cooking. I know I have shared some reasons before, but recent changes in my husband’s employment have reaffirmed my reasons for cooking once a month. We used to get paid 2-3 times a month. Now, we both get paid only once, and on the same time. My freezer cooking is an integral part of out budget. We shop once a month and cook once a month. We don’t really eat out, saving our diets and our wallets! The first weekend of each month is my cooking weekend for 2 simple reasons… it’s our payday and by the end of the month, our freezer is just about empty. I was sharing with my husband today that I have a love hate relationship with my cooking weekend. I love having a month’s meals (breakfasts, lunches, and dinners) all done and ready to go, but I HATE how tired I am at the end. We split it up over 2 days this time. We could have done it all at once, but I got a late start the first night after a shopping trip to Costco and my feet always bark at me when I do a full day of cooking! Monday’s are breakfast burrito day. I have an intolerance to egg yolks, so all of my breakfast items are made with egg whites. A healthier option but you can easily substitute whole eggs. Start with frozen hash browns. I cook them on the stove top. When they are done, (usually about 6-7 minutes), pour in eggs and crumbled meat. My preference is crumbled bacon, but I also use crumbled breakfast sausage. Love bacon?? Costco has cooked crumbled bacon, usually near the baking or salad aisle. OMG!! Grab a handful and drop it in. Easy peasy, lemon squeezey! Top with cheese and you’re done with the filling. Start with a stack of tortillas. I use an ice scream scoop to scoop and fill. Roll, wrap in foil, and you’re all done! Tuesday’s are pancake day! The kids love pancakes and I know what your saying… “All that sugar and where’s the protein?” Simple. I cook a package of breakfast sausage each week. The package comes with 16 links- 2 per person, twice a week. So with the pancakes we serve sausage. Lower the sugar count with less syrup or even better, top the pancakes with peanut butter! Today I cheated- a big box of Bisquick and my kitchen aid! I added some chocolate chips to some, fresh blueberries to others. HUGE batch. Freeze them flat and then bag them up. Then you can either pop them in the microwave or toaster in the morning. Just like the frozen box of waffles or pancakes, but much cheaper and a bit healthier too. Of course, you can always make your pancakes from scratch and then freeze them. Wednesday’s are breakfast quesadilla’s. Go back to the filling you used for your burritos, but leave out the cheese. I then use my griddle for the cooking. Lay out a tortilla and sprinkle a bit of cheese. Add the egg/potato mixture. Top with a little bit more cheese and cook! I cut mine in half so share since my kids are younger and don’t eat an entire one. Wrap them in foil individually and freeze them in a big bag. I usually take a frozen one, and place it in the oven when I get up. Set the oven to about 350. By the time your showered and ready to eat, about 30 minutes in my house, they should be warm and ready to eat! Thursday’s are French Toast Sticks. I found a great recipe on Pinterest, but like most things you find on the internet, it didn’t quite work as I planned. So I’ll tweak it. Basically, you take some really nice thick bread, slice it into sticks, dip into your mixture of eggs, spices, and mil/heavy cream, and cook on the griddle. Freeze them flat before you bag them. Again, we serve them with sausage for protein. Friday’s used to be doughnut day. Each Friday I would take my son to get a doughnut before dropping him off at school. BUT, doughnut’s aren’t the healthiest way to start to the school. So Friday’s are now muffin day. I love Costco sized muffins and I really am not a fan of small muffins. So I bought a jumbo muffin pan. I make 4 batches each month. I found a good recipe for Costco like muffins that uses a cake mix as a starter. I’m always looking for ways to save the budget. On a shopping trip to a large bulk store I found a bulk cake mix. Perfect I thought. Well, maybe not. After multiple tries to make my muffins, each with little success, I am back to the boxes. Choose your favorite muffin recipe and you’re set. Serve with yogurt for an easy breakfast and healthy too! Pizza is something that everyone enjoys, in one form or another. My personal favorite is cold pizza for breakfast. Weird I know. I love leftovers the following morning. In my book, it’s a great go to for breakfast. It’s got protein in the meat, dairy in the cheese, carbs in the bread, and very little sugar. Need fruit? Go for it! Pizza is something that my son loves to help us make. About a year ago we started making our own dough and pizzas at home. We found they taste much better than the store bough frozen variety and were much healthier. We’ve experimented with several dough recipes, and found a great no knead dough at Onceamonthmom.com. I use this dough for pizzas and hot pockets. What I hate though is buying a can of sauce for pizza, and having half a can left over and wasted. So today I made all things pizza. A great way to use up the sauce and pepperoni and have several breakfasts, lunches, and dinners all ready to go for school. Split the muffins and place on a baking sheet. Spread a thin layer of sauce on each muffin half. Bake at 350 for 7-9 minutes. Flash freeze (freeze flat on the sheet until frozen) before wrapping individually. place eat pizza in a large zip lock bag. Unwrap and place in microwave for 1-2 minutes. Just like a quesadilla, it’s a Pizzadilla! Place your pizza toppings (without the sauce) in a tortilla and cook on a griddle or in a pan. As with other pizza items, flash freeze before individually wrapping. For little hands, cut the pizzadilla into strips. I haven’t bought a box of hot pockets in quite a long time. I love making my own, and while they aren’t always pretty, they taste much better! These little pockets are also a great way to use up left over lunch meat (not enough for a sandwich) and other little nibbles in the fridge. The possibilities are endless. Using your dough that you’ve already made (and always have an extra ball in the freezer for last minute meals), roll into a rectangle about the size of your cutting board. Cut into 3 long rectangles. Place your toppings, sauce, and cheese in the middle. Wrap it all up like a mummy. I have the best luck with pulling the sides over and then the ends. Place seam side down on a greased baking sheet and bake at 400 for about 15 minutes. 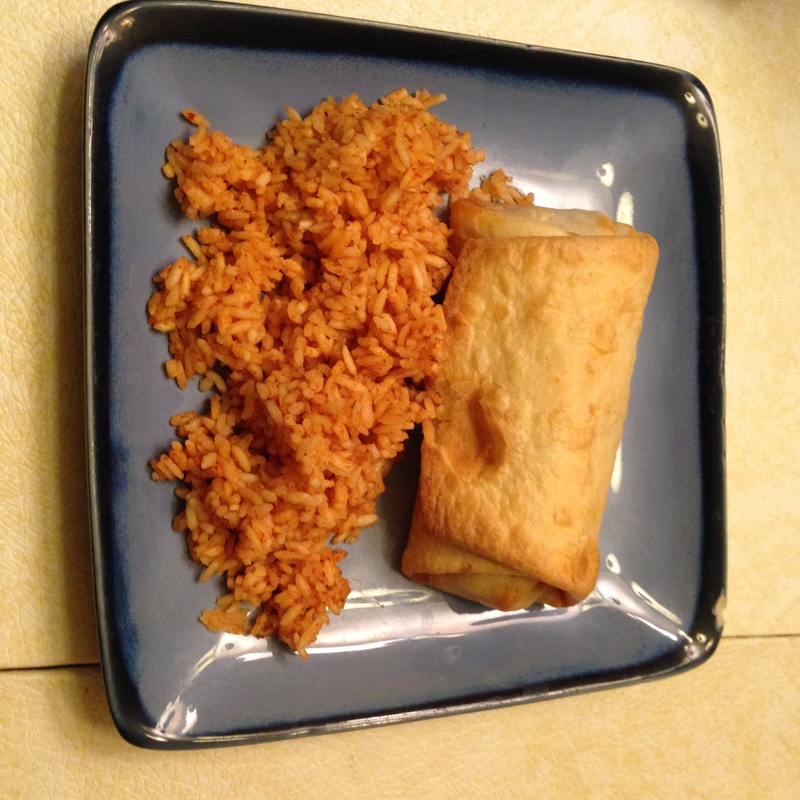 Watch for browning… you don’t want burned hot pockets! Other than the obvious thought of Pizza, I stumbled upon this wonderfully easy and frugal pizza tasting dinner. It’s called Bubble Pizza. Like bubble bread or monkey bread, it’s centered on the use of canned biscuits. It couldn’t be an easier recipe to make either. Like all pizza recipes, the flavor combination possibilities are endless. Make it to suit your family’s likes. Cut the biscuits into quarters and place into a bowl. Add the toppings, 1 ½ cups cheese, and cheese to the cut up biscuits. Place into a greased baking pan. I used a disposable cake pan this time. Top with remaining cheese and basil if using. Bake at 400 for 15-20 minutes. Check for browning. Allow to cool completely before freezing. Cover tightly and label. Allow to thaw and simply reheat in the oven! Couldn’t be easier!! As a mom and a teacher I know that breakfast is the most important part of the day. I also know that it’s the one meal that often gets skipped when we’re in a hurry to get to school, or the meal that contains the least nutritional value. Too often kids are eating sugary breakfasts that lack any nutritional value or protein. By recess, their brains are turning to mush, they are getting sleepy, and that important reading lesson that the teacher is presenting isn’t making any sense. I’m guilty of this too! I either skip breakfast as I run out the door or I run through the drive through. Neither are good for my waistline or pocketbook! Here are my go to recipes for breakfast. They are healthier than the sugar cereal or donuts and will help you and your little one make it to lunch. Preheat the oven to 350 degrees. Mix all the ingredients, except the peanut butter and jam, together in a large bowl. It is easiest to do this with your hands. Once it is mixed well together (it should be crumbly like a graham cracker crust) make a small ball and press into the bottom of your muffin tin and up the sides. 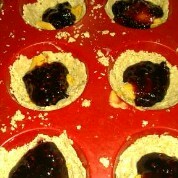 Add in 1 spoonful of jam and peanut butter in each muffin. Next, with the remaining mixture create 14 equal size balls. Smash each of the balls into a circle large enough to cover the top of each muffin. Make sure you seal each muffin. Bake for 20-25 minutes until slightly browned. Remove from the oven, allow to cool for 5-10 minutes and then gently remove to a cooling rack. Let them cool a bit before removing them since they are a little soft and squishy when warm. 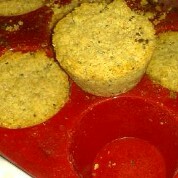 I find using my silicone muffin pan works best. Follow directions above but allow to cool completely. Flash freeze on a flat pan before putting in a gallon freezer bag and freeze. Ready to eat? Allow to thaw overnight and enjoy. This is a wonderful recipe for emptying out those jelly jars that have just a little bit left in it. It’s as simple as it sounds. Tortillas and filling. I usually stick to egg whites (can’t eat regular eggs), hash browns, crumbled bacon (get the bag from Costco that’s already crumbled), cheese, and whatever else you may like. The trick to these is to make a bunch and freeze them. I usually make a BIG pan full of filling and then start filling and rolling. When you are ready to freeze them wrap them in either wax paper or parchment paper first, then aluminum foil. Make a stack of foil, with wax/parchment on top, then foil, and wax/parchment, etc. Then when you are ready to assemble, just wrap, wrap, and go to the next one. Place them all in a freezer bag. To serve, unwrap the foil and wax/parchment if you wish and microwave for about 1-2 minutes. These may not sound very healthy to you, and you’re right. I always have these with either yogurt, a glass of milk, or string cheese. I leave off the icing on top and use log sugar jam or nutella (my son’s favorite). Start with store bought pie crust, the kind you get in the biscuit area that comes in a roll. Roll it out and cut into rectangles. I bought the fruit pie cutter from wilton, and LOVE it! Place your filling in the middle, not too much though and then top. Press the edges with a fork and place on a greased cookie sheet. Bake at about 350 for 15-20 minutes, or until lightly browned. 2 boxes of pie crust (on sale right now) make 12 pop tarts. I used less than 1 jar of jam. These are another great item to use of end of jars. A tip. 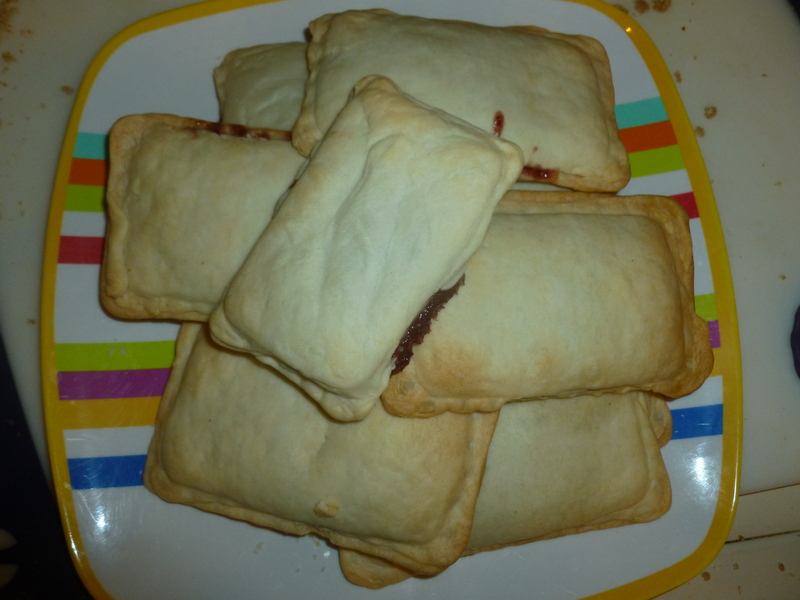 If using jam or jelly, add a little cornstarch to it before filling your poptarts. This will make the filling a little thicker so it doesn’t run out the edges. After they have cooled, wrap each one individually and freeze. To serve: I pop them in the toaster oven and toast, like a pop tart. To be honest, I don’t own a regular toaster, so I’ve never tried that method. I am worried about the filling getting hot and oozing out in my toaster. Tonight’s dinner didn’t start in the freezer, but the leftovers will surely end up there! My oldest son LOVES corndogs. He particularly loves the giant ones he eats at the baseball game with his grandparents. I’m all for fun food on a stick, but sometimes I worry about what is in those darn tasty dogs. (I don’t worry about them when I’m eating them just when I should be doing other things!) Since we’ve been working on eating healthier and watching what is in the food we are eating, I thought homemade corn dogs would be a good item to try. I have to admit, I’ve tried these in the past and failed miserable. The corn part falls off and the things looks like some sort of alien food or something that a small child mixed up and put in the oven. Then I stumbled across a recipe on Pinterest (LOVE THAT SITE, THOUGH IT TURNS INTO A BLACK HOLE!!). The website Out of the Box has tons of recipes for people trying to ovoid boxes foods filled with preservatives and other things most people cannot even pronounce. The recipe is simple. The neatest part is HOW they get the corn batter on the dogs. First, make the batter in a jar (YUP, a quart size jar). Then after sticking the stick on your dog, roll it in flour, and dip it into the jar to coat it. Brilliant! The coating stayed on, and they turned out beautifully. My son said, “WOW! Those look Yummy!” I got to use healthier turkey dogs and everything in the batter I could pronounce. Success!! The leftovers will be frozen and make for quick and easy lunches, or dinners when dad is at work. Enjoy the recipe! Preheat 1-2″ oil in large pot to 375 degrees. Place cornmeal, flour, baking powder and salt into the quart jar. Secure lid and shake until ingredients are combined. Add eggs, milk and honey. Shake again until mixed thoroughly. Open jar and give batter a few stirs with a spoon to make sure all ingredients are incorporated. Pour reserved 1/2 C flour onto plate and roll skewered hot dogs in flour to coat. Dip hot dogs into jar several times to coat with batter making sure all parts of floured hot dog are coated. Let excess batter drip off. Place corn dog in 375 degree oil and cook until golden brown. Let corn dogs come to room temperature, then place in plastic freezer bag and freeze. Corn dogs can remain in freezer for up to 3 months. Bake corn dogs for 10-15 minutes, turning occasionally. 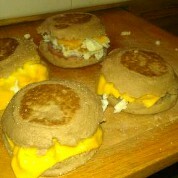 Breakfasts: homemade cereal bars (favorite of my toddler) and Whole Wheat Egg white McMuffins. I might sneak in some Peanut Butter and Jelly French Toast too. It wad a hit last wee! Lunches: Pizza Rolls, hot pockets, Chicken quesadillas, and fruit and nut salad. Dinner: Skinny Fish cakes (my husband and son have been spending lots of time at the lakes), pizza, Chicken Cordon Blue Bake, leftovers, and Tamale Pie. It’s a short work week with the local fair starting, and family coming to visit on Saturday. Enjoy the recipes!! These taste just like the fruit filled cereal bars you find at the store. I got the recipe from my favorite freezer cooking blog. It’s so simple that after making them once, you won’t need the recipe anymore! Mix all ingredients except the jam/jelly in a bowl. I’ve done this with my hands and with my kitchen aide. Both work. Mix until a crumbly mixture forms. (Like the crust to a tart or cheesecake). Take small balls and press into a muffin pan, forming a cup. Fill with filling (I made some with peanut butter and jelly today!!). Then add more crumb mixture to the top. Mason loves to help make AND eat these!! Bake at 350 for about 20-25 minutes. Then let cool before removing from the pan. I use my silicone muffin pan and they pop right out. Today I added Chia seed to them, and I’ve been known to add things such as sunflower seeds and flax seeds to the crumb mixture too. They freeze well, but we never get them to the freezer! This was a recipe that I stumbled upon on Pinterest. Oh how I can get lost on Pinterest! These roll-Ups are so easy to make, and my little one LOVE to help make them. 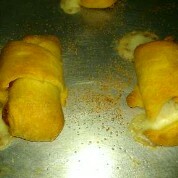 Roll out and separate the crescent rolls on a cookie sheet sprayed with cooking spray or covered with parchment paper. Place 4-5 pieces of pepperoni on each triangle. Add half a string cheese stick on top. Roll them like you would a roll, and tuck end over. Sprinkle garlic powder on all the rolls. Bake at 375 for 15-20 minutes. Dip in pizza sauce and enjoy! These will freeze well too, but we will just keep these in the refrigerator for this week. I am addicted to the McDonald’s drive thru. This is bad for my pocketbook and my waistline! So here’s my own healthier version of their McMuffin. Split the muffins in half with a fork. Place 1 piece of Canadian Bacon on each bottom. Cook the egg whites in a pan. Figure on 2-3 egg whites per sandwich. Add salt and pepper to the eggs while cooking. When done, divide into the number of sandwiches you are making and place on top of the bacon. Add a slice of cheese on top of the eggs. Top the sandwhich and wrap. I wrap these sandwiches in parchment paper before wrapping in foil if I can going to be freezing them. The WW Plus points are the same for both this sandwich and the one at your local drive thru, but the savings come in the cost! I made my 4 sandwiches for $4, instead of the $12 I would have paid… Go me! Easy Dinner and lunch too!